The airlines of SKYTEAM, Official Alliance Network for Shechtman International Symposium, offer attractive airfares for participants. SKYTEAM comprises 9 leading international airlines: Aeroflot, Aeromexico, Air France,Alitalia, China Southern Airlines, CSA Czech Airlines, Delta, KLM, Korean Air, serving 856 destinations in 169 countries with 13,133 flights daily. To benefit from these special offers, link up with www.skyteam.com/GlobalMeetings and quote the Identifier Code. Through this site you can also access the schedules of all SkyTeam partners to plan your flights on the airline of your choice. Discounts are valid for the period from 19 June - 14 July 2014 and will apply to discountable fares where American Airlines, American Airlines codeshare (except Alaska Airlines and Horizon Air), or oneworld alliance partners are involved. AA must be the governing carrier. The use of American Airlines codeshare will require one segment of the itinerary to be on AA metal, the discount be no greater than 5%. All fare rules and restrictions apply. Tickets can be purchased through the American Airlines website, www.aa.com free of charge mentioning the authorization code given below. Use also AA Meeting Services Desk for reservations and ticketing. Valid for travel to/from all markets where American Airlines, American Eagle, American Airlines codeshare, and all oneworld carriers provide service. Air Canada is the official Canadian airline for Shechtman International Symposium. Special Rates are guaranteed by Air Canada for all attendees of the symposium. These rates are valid from Friday, 19 June, 2014 and ends on Friday, 14 July , 2014. To book a flight the attendees need to access www.aircanada.com and enter the following promotion codes in the search panel. AIR FRANCE & KLM Global Meetings is the official airline for MMM2013 INTERNATIONAL SYMPOSIUM. Special Rates are guaranteed by AIR FRANCE-KLM for all attendees of the symposium. These rates are valid from June 17, 2014 - July 16, 2014. To book a flight the attendees need to access Air France - KLM and enter the following Event ID. One way per person transfer: $12.00 USD This is for individual travelers who do not mind sharing a transfer with other people who are not part of the group. From 5:00 pm to 11:00 pm everyday: A shuttle will be picking people up every 30 minutes at both airport terminals. One way per person transfer: $20.00 USD. People will be sharing with other people from your group. Amstar will set up a hospitality desk to assist the participants with anything they may need. Citizens of many countries do not need advance visas to enter Mexico for conference or tourism. A simple procedure is only required in the arrival airport. Citizens of other countries that require advance visas need to follow the simple procedures as outlined in the Mexican Consulates/Embassies in their country or covering geographical area. A list of the Mexican Consulates and Embassies are given below along with a hyperlink to their web Sites. 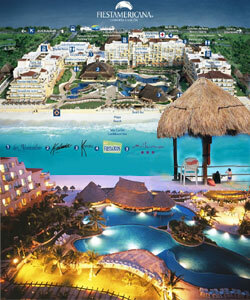 Generally it is a very simple procedure to obtain a conference or tourist visa for Mexico. The foreigner whose country is not on the list, and would therefore require a visa to enter Mexico, can enter the country without the need of a visa, if they have a valid visa to enter the United States of America. USA Transits: The attendees that chose to come to Mexico through USA may need a proper US transit or tourist visa according to reciprocal agreements with government of USA. If you choose to fly directly to Mexico directly or from a third country you do not need a USA visa. Many options are available for direct flights. For more information please check the link "Cancun Airline Connections" . In addition, foreign visitors who, regardless of their nationality, have a valid permanent resident card from Canada, the United States of America, United Kingdom or any of the countries comprising the Schengen Area, do not require a Mexican visa.